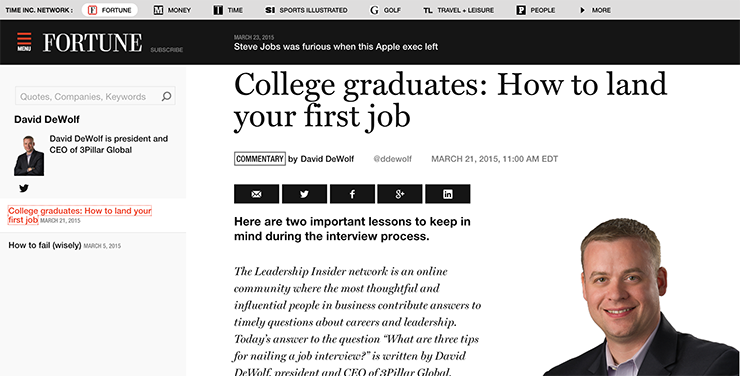 Fortune Insider recently published an article from 3Pillar CEO David DeWolf with tips on how college graduates can land their first job. In the article, David recounts his first job interview with the Colorado Springs Sky Sox in highlighting some of the “must-have” traits for college graduates during the interview process. Among the most important qualities for job-seekers to have, David advocates the need to “be passionate, but prudent.” He urges college graduates to draw on their natural talents and pursue their passions yet at the same time reinforces the need to distinguish between a passion and a hobby. Another important tip David shares with college graduates in pursuit of their dream job is to present yourself as confident enough to get the job done but humble and self-aware enough not to come off as a know-it-all. This article was written by David in response to one of the questions on the Leadership Insider network, an online community at Fortune Magazine online where the most thoughtful and influential people in business contribute answers to timely questions about careers and leadership.